The system - called neurofeedback - trains musicians to clear their minds and produce more creative brain waves. 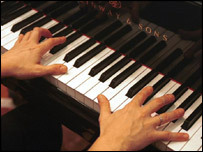 Research, to be published in the journal Neuroreport, indicates the technique helps musicians to improve by an average of 17% - the equivalent of one grade or class of honours. These filtered brainwaves are then 'fed back' to the individual in the form of a video game displayed on a screen. But Dr Tobias Egner said: "This is the first time it has been used to improve a complex set of skills such as musical performance in healthy students." And Professor John Gruzelier added: "While it has a role in stress reduction by reducing the level of stage fright, the magnitude and range of beneficial effects on artistic aspects of performance have wider implications." "The technique has turned a brilliant pianist into an extraordinary one"